Mr. Fanatic is finished laying tile & in our Master Bath! Today he grouted. Installing the vanity & putting in new base molding comes next. Then it will all be finished! He started last Saturday & I can tell you it has been a long five days! I have a very difficult time being displaced! I like having my things in their proper place & during this time I have had to improvise. We should be totally finished by Sunday so I can post the final photos that evening. 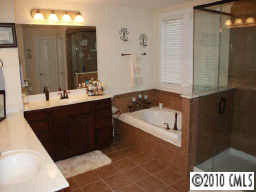 Here's what our master bath looks like all put together with vinyl flooring. 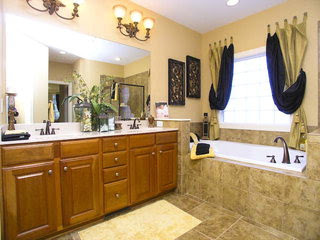 You can see additional photos of the Master Bath here. 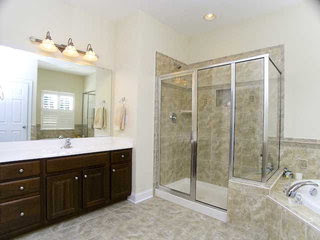 The tile needs to be wiped a few more times to take off the grout film. 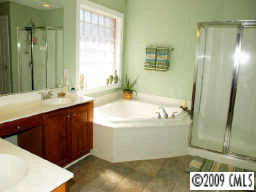 Mr. F is also going to put tile on the front of the tub. I think it will add a little something. I kind of like the dramatic window treatment in the second photo. I just might have to whip something up...What do you think? Pam, I know what you mean about stuff being in a mess while a project is going on. It drives me crazy and I just want it done yesterday!! 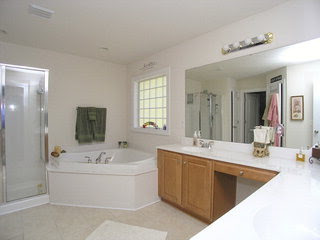 I am sure your bathroom will look better than the competition.